2017 is the year of interactive emails, as per the marketing trends predicted by Litmus. Adding interactivity in emails not only helps in increasing user engagement, but also helps in improving the conversion rates. One way to do this is using kinetic design for your emails. Kinetic emails are designed around the concept of offering the users a visual experience through their emails within the inbox itself. Such emails use a coding technique that enables creation and rendering of high-impact interactive emails. Designed around the concept of providing audience with information in an interactive and informative way, these emails stimulate a website experience without having to leave the inbox. Previously, when email clients such as Apple Mail had robust modern HTML and CSS support and majority of other email clients didn’t, designers had to code emails for the lowest common denominator. With the launch of iPhone, more email clients started to support modern HTML5 and CSS3. This gave designers and email marketers a reason to create mobile optimized advanced layouts for emails. The kinetic design works with Yahoo Mail, Gmail, Outlook 2003, Outlook.com, AOL, iPad, and few other Android clients. 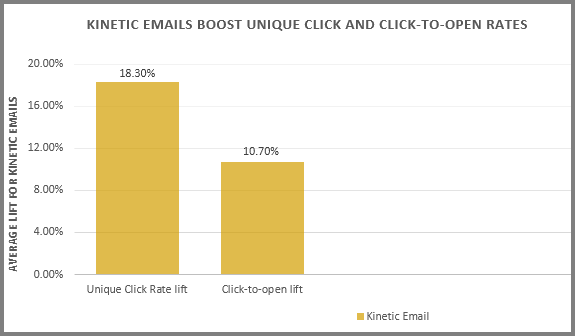 A research from Experian’s Email Benchmark Report 2016 shows that as compared to non-kinetic emails, the unique open rates and open-to-click rates for kinetic emails has increased by over 18% and 10% respectively. Kinetic emails include interactive email design elements like Sliders, Carousels, Search in email, GIF, Graphs, Menus, Rotational Banners, Scratch and Flip and Hover-over animation that make the emails more engaging. 1. Kinetic: Emails that use animation and CSS transitions to highlight the key content in an email are kinetic emails. These emails use automatic sliding carousels with each slide displaying a different set of content. Take a look at this example from Forever 21. 2. Kinetic Interactive: These are emails that have additional elements that respond to user Kinetic interactive emails involve the use of the :hover, :active, :focus or :checked CSS selectors. The elements used in these emails are user-driven carousels containing navigation buttons and collapsible menus. This email from Adidas is a perfect example for kinetic interactive email. 3. Kinetic Effects: Kinetic effects in emails take interactivity to the next level by embellishing content by adding hover-over animations and attention focusing effects. Take a look at this email from the brand Lego that has used hover-over animation in their email. Kinetic emails also integrate fallback techniques to ensure that these emails do not render poorly on email clients that don’t support kinetic content and design. If you haven’t started using kinetic design for your emails, now is the right time to incorporate it into your email campaigns to increase involvement from your subscribers. If you are looking to integrate kinetic design in your next email campaign, Monks can help you. Get in touch with us at hello@emailmonks.com. The post Take Interactivity to the Next Level with Kinetic Email Design appeared first on Email Monks Blog: Email Marketing Tips & Best Practices.